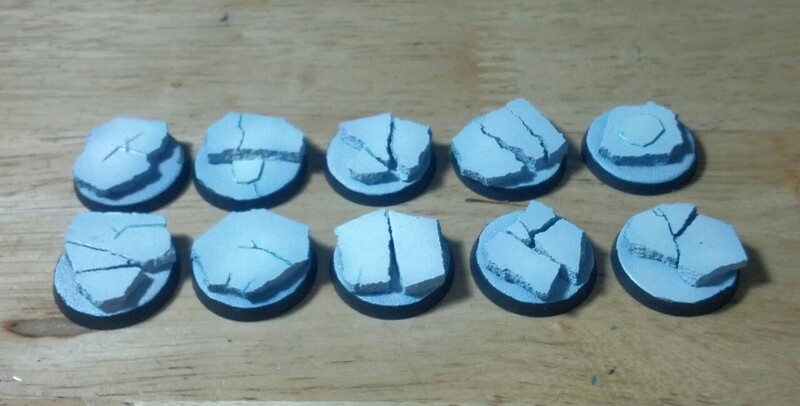 So I tried my hand at some ice world bases. Not perfect but pretty good and considering they are made with about 20 cents worth of materials for 10 rather than paying a dollar a piece for resin bases, I’m pretty happy. I tried using Future acrylic wax to make them shine more like ice, but I think I’m going to add a light coat of water effects to get the shine even higher. The last few days have been really productive. The airbrush really makes these guys fast to put together. Still need to do the gems/details and touch up the weapons, but a couple hours should have them table ready.